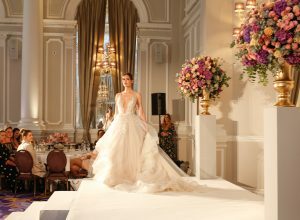 The ballroom looked magnificent and hosted 120 Brides readers for a catwalk showcasing Blush & Ivory dresses. Guests were treated to complimentary Moet champagne, Bobbi Brown makeovers and consultations with luxury wedding planner Alexandra Pisani and Blush & Ivory’s designer Julie Vino, who had flown over from Israel for the event. By Appointment Only designed some stunning floral displays – with two large urns of colourful flowers flanking the stage, and pastel tone centrepieces on each of the tables. Julie Vino’s dresses are for a contemporary bride looking for an eye-catching wedding gown. These included a variety of fashion forward styles, with a stunning combination of textures – mixing lace and tulle with sheer elements. Feathers, tassels, bell sleeves and embellishment also added unique and special details.